About ten years ago, I learned a valuable lesson: I learned what you get for being transparent. I was still single and hadn’t even met my husband yet, but there was a guy I was interested in. He seemed like a very nice, godly guy, and he seemed to pay attention to me in an “interested” way. I was lonely at the time and I knew God had promised me a husband. I thought about this guy a lot and wondered if he was The One. However, time passed. This guy still seemed to treat me like he was interested in me, but nothing happened. He didn’t ask me out. We didn’t have any deep conversations. No progress was being made in this friendship. I didn’t know what was going on, and I was very frustrated. For months, I prayed and stewed about it (and not necessarily in that order). I got pretty discouraged, and finally decided I couldn’t take it anymore. I called a girlfriend that I had recently met at my church, who knew this guy as well, and I confided in her. The guy was married. He was basically leading a double life. I hadn’t had a clue. Instantly, though, I assure you that I lost all attraction to this guy! After that, I avoided him like the plague, and within a couple of months he moved out of town anyway. Problem solved! I had been so anxious and upset over that situation. However, all my anxiety left the SECOND I confided in my friend. I gained freedom and got to move on. Because God uses transparency and light, not darkness and walls. I had been upset because I was keeping everything in, keeping everything behind strong walls of distrust that I had built up over the years. However, it’s a trick of the enemy to keep people behind walls. Keeping things in darkness is not from God. God is Light; in Him is no darkness at all. When I opened up to my friend, I tore down that wall and let God’s light shine in on the situation. His light brought instant freedom and healing. Ah, you said the word that makes the key difference: “silence.” Yes, sometimes you need silence. However, silence and darkness are not the same thing. What’s the difference between holy silence and darkness? Holy silence is when you keep godly, holy things in your heart and ponder them, much like Mary the mother of Jesus kept the circumstances surrounding Jesus’ birth in her heart and pondered them. Holy silence breeds the fruit of the Spirit (love, joy, peace, patience, gentleness, kindness, faithfulness, self-control, etc). Holy silence brings revelation from God. Holy silence draws us into prayer while we listen for God’s downloads about a particular subject. Darkness is the total opposite. Darkness conceals secrets and prevents healing. Darkness tells you that you can’t trust or confide in people. Darkness tells you that people would judge you if you talked about what’s on your heart. Darkness makes you feel condemned and hopeless. Darkness breeds fear, distrust, anxiety, doubt, unbelief, and selfishness. Darkness tries to tell you that you’re an island, and you don’t need people. Anything that doesn’t produce the fruit of the Spirit in your life is darkness. Darkness is always a lie. Being transparent is always the antidote to darkness. If you’re bound up in some kind of anxiety, worry, lie, sin, emotional wound, or any other work of the enemy, then being transparent is the first step to healing. Therefore confess your sins to each other and pray for each other so that you may be healed. The prayer of a righteous person is powerful and effective” (James 5:16 NIV). Healing and freedom come with transparency. It’s one of the most important lessons I’ve ever learned. What are you dealing with today? What walls have you put up to keep people out? What sins, anxieties, worries, doubts, and fears are you keeping behind closed doors? Are you struggling with lust, addiction, depression, discouragement, doubt, or anger? If so, would you open up today? Would you find a trustworthy brother or sister in Christ and come out from behind your walls? 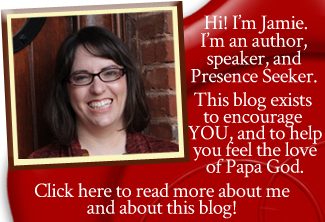 Would you be transparent, letting the light of God shine into your heart, mind, and spirit? If you will, you will find freedom too. Does this message speak to you today? 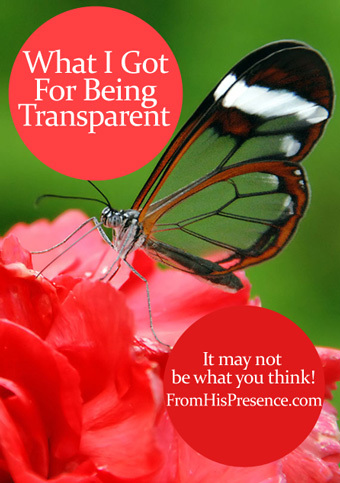 Is the Holy Spirit urging you to open up with someone and be transparent about something in your life? If so, leave a comment below! Image courtesy of Tobias on Flickr. This post is linked up over at Titus 2 Tuesday on Cornerstone Confessions. You are most welcome! Thanks for reading, Renee! My favorite sentence in this post: “Because God uses transparency and light, not darkness and walls.” How powerful. I am currently going through darkness and God is totally replacing dark with light, something that happens gradually in my case. And it’s not the exact same thing as what you talk about, but this week I had a hard time sharing with my friend. I have hurt a great deal over the years and I didn’t want to share because she’s witnessed so much of it. I was thinking she’d have an opinion about it still being dark at times, getting tired of me. The next day I decided to send out my e-mail to her about how I was doing and nothing but love came from her to me. No judgement just encouragement about God doing more work on my heart and giving me more freedom. It’s another way of being transparent, but a very important one! It’s simple: when you keep silent, it’s in trust of God and that he’ll do something for us while in darkness one is in a bad state of mind and he may do bad things for himself and others. I needed this post. This is great. I’ve felt strongly that I’m supposed to be silent and ponder and pray about somethings I feel the Lord has been speaking to me. Some things are really stretching me. I have experienced moments of anxiety but I feel like the Lord wants me to wait and trust. I tend towards over sharing, I think He wants to confirm things through people I trust but when I over share I remove those He can speak through. I’ve started clinging to scripture and prayer, looking for His peace, and waiting. I think He is really teaching me about discernment and testing the Spirits. I’ve been really going through it and tired…I feel like I’m in boot camp!